On a recent trip to Chicago I did a little John Hughes tribute tour. We went to see Ferris Bueler’s high school and the house of his movie friend Cameron. 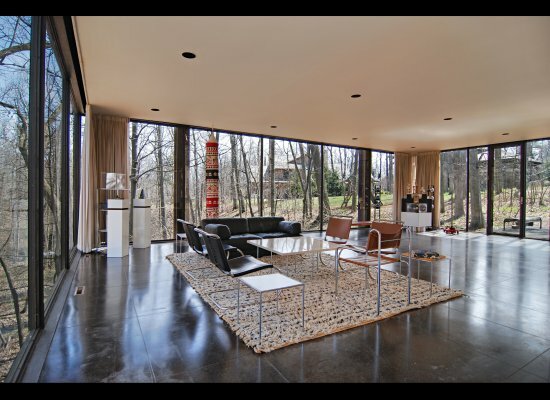 Imagine my surprise to discover that the famous glass house is for sale! It’s on the market for $1.65 million. The house, located in the leafy suburb Highland Park, was designed by architects A. James Speyer and David Haid in 1953. It offers 5.300 square feet of living space and floor to ceiling windows throughout offering views of the ravine that give this part of Highland Park, Ravinia, its name. The house is featured in a very famous scene from the movie. It’s when Cameron has a breakdown when he returns his dad’s Ferrari and discovers that hundreds of miles have been added to the odometer. He and Ferris decide to take mileage off the odometer by putting the car in reverse on a jack. The jack however lets go when Cameron kicks the car out of frustration and sends the car crashing through the glass and into the ravine. This entry was posted in Famous buildings and movie locations, Homes of the rich and famous, See how others live, Unusual homes and tagged A. James Speyer and David Haid, Cameron's house, Chicago, ferrari, Ferris Bueler Movie locations, filming locations, for sale, glass house. Bookmark the permalink.